Our friend and fellow soap fan, LuAnne Cobb from Ohio, attended the third stop on the Soap Opera Mania on Tour Saturday in Cleveland and was kind enough to share her recap of the event with us. Kara and I met LuAnne in the wee hours of the morning standing in the “All My Children” FastPass At Super Soap Weekend 2007 in Disney World and we met again over dinner at SSW 2008. LuAnne is a longtime soap fan and an expert in the ABC soaps. Read and enjoy her recap of the third Soap Opera Mania event. My friend Sue and I attended the third stop of Soap Opera Mania on Tour, being promoted by a Michigan company as a precursor to the 3rd voyage of Soap Cruise in January 2010. We got to the hotel where the event was being held at 6:45 am, hoping to be the first in line (we were!) and stood in line until the doors opened at 10:00. We got a glimpse of 4 stars checking into the hotel at 7 am, just arriving from the West coast. Around 9 am, we spotted Cameron Mathison and John-Paul Lavosier just finishing breakfast, so we stopped by to say hello. When the doors opened, Sue and I made sure to get front and center seats, which were set up in theater fashion in the shape of a horseshoe with a small stage in the middle. While waiting for the show to start we checked out the merchandise table, where there was shirts, hoodies, tote bags, photo albums and pins. We also picked up our event programs. Before the show started, Sue and I were both interviewed by Julie Clark Robinson, a local lady who reports for Soaps.com. Sue also was interviewed by a local newspaper reporter. 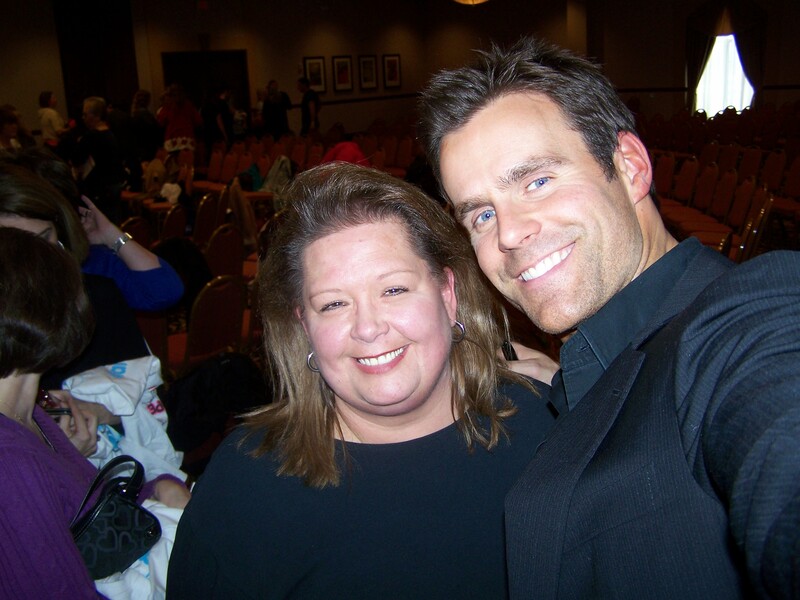 Shortly after 10, the event director Mike welcomed the fans and introduced Cameron Mathison (Ryan on AMC). Cameron then introduced John-Paul Lavosier (Rex on OLTL), Laura Wright (Carly on GH), Tyler Christopher (Nikolas on GH), James Scott (E.J. on DAYS & formerly Ethan on AMC) and Christian LeBlanc (Michael on Y&R). Christian then introduced Brandon Beemer (Owen on B&B), Austin Peck (Brad on ATWT), and Murray Bartlett (Cyrus on GL). The fans were clapping and we were so excited! Getting to see nine great soap stars 10-feet away was my best experience since Super Soap Weekend in November! The first hour was a question and answer session. Christian and Austin took turns handing the microphone to the fans. We asked both personal and storyline related questions and shared a lot of laughs. Christian is a hoot, and also a long talker! After that, the stars split up in different parts of the room and lines formed for the fans to get autographs and pictures. During this time, Sue and I met with Cameron, Christian, JP, James and Austin. I asked John-Paul who he hopes Rex’s father will turn out to be and he quickly said Bo. He shared his theory: Before Bo went to Viet Nam, he had his sperm frozen and somehow Roxy got it and Rex was born! I also asked JP why his head was shaved and was told we would find out on OLTL in the next month. (Soap operas are shot four-to-six weeks in advance). All the ABC stars signed my 8×10’s that I made up from photos I took at Super Soap, along with 5×7 pictures that were in the program. I also bought a black t-shirt at the event and I had all the stars sign it with a silver Sharpie. Austin created a very good humorous caricature on my shirt as well. After this, the stars were given an hour lunch break. After a half hour, a director from Guiding Light, Adam Reist, spoke to the fans about scripts and sets and directing. He showed a few short videos and told us his background. I later told him that a GL alum, Melina Kanakaredes, is from my hometown and Adam shared a funny story with me from when he was in Akron for Melina’s wedding. I enjoyed meeting him. The stars were back from lunch now, and it was time for a few lucky fans to act out a scene with their favorite stars. I was not picked, but my friend Sue got to act as an extra on stage in one scene. I laughed so hard at one point I had tears in my eyes. Cameron and JP were acting as fallen mannequins. Cameron was lying face down on the stage with JP lying on Cameron’s back half with his head between Cameron’s legs. It was hysterical! These actors can sure improvise in a heartbeat. Once again there was a question and answer session, followed by a second meet and greet. I met Tyler, Laura, Brandon and Murray. Laura was gorgeous, Tyler looked tired, Brandon has the prettiest eyes, and Murray speaks with the softest Australian accent. During the second session, the promoter gathered each star and filmed future promos with different fans. Sue sat next to her favorite, Christian, for probably 15 minutes while they filmed promos to run during future CBS soap telecasts. I jumped in at the end, along with Brandon, and Austin (who had his arm around me the whole time) and we filmed promos for the next Soap Cruise. Hopefully I’ll get to see it on TV or on the web sometime! The program was over and we left around 5:00. The stars were also getting ready to leave and make a two hour drive south for their next stop on Sunday in Columbus. I left with a smile on my face and wonderful memories for a lifetime.